Recipes for cakes for dogs call for a quality flour. Flour is the main ingredient in any healthy cake mix. While commercial human cake mixes use sugar as their main ingredient we advise against this. When you look at the flours available in the grocery store you will notice that some are bleached and some are unbleached. You will also see that some are fortified and some are not. We encourage you to use natural unbleached flour. Bleaching is a process used to make flour whiter and prettier. It is not designed to make it healthier, and in fact, it may make it less healthy by stripping away natural parts of the grain. Fortified flours have vitamins added. 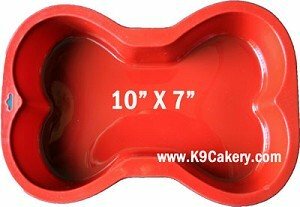 These can be a good choice in dog cake recipes but are not essential. Silicone baking pans are good choices! This is a good choice when following dog cake recipes or dog birthday cake recipes. It is made from a combination of soft (less gluten and protein)and hard (more gluten and protein) wheat. Therefore it is a good standard if you don't want to purchase a specific type of flour for a single use. This type of flour is all purpose flour with salt and leavening already added. This is not the best flour to use when following dog birthday cake recipes from scratch. A true scratch recipe will tell you which leavening to use and how much. If you use self rising flour, your ingredients will be off. This is a good choice for cakes. As its name implies, it is designed to make light and fluffy products. This is because it is lower in gluten (a protein found in grains that holds things together in baking)than some other flours. A flour too high in gluten will make a heavier product. Most cake flours are fortified with vitamins. Only you can decide if you want to use this type of flour in your recipes. This type of flour is often found in dog products. It is beneficial because it is made from the whole grain. This is a healthy choice because it is in the state that nature intended. The downside of whole wheat flour in dog cake recipes is that it is high in gluten and therefore makes a heavier end product. This flour is made from rice. It has no wheat and is therefore a good choice for those who want to make a wheat free cake. It also has no gluten since rice has no gluten. So if you want a cake that is wheat free, gluten free, corn free and soy free, this is a great flour to use. If you decide to use rice flour, you will also want to add some starch (corn or potato) to help it form a good cake. Sugar is used in baking not only as a sweetener but also as a leavener. It also helps the cake to get that appetizing golden brown color. 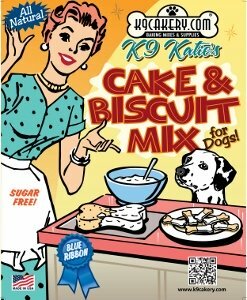 A dog cake recipe that calls for no sugar may not rise as well nor brown as well as a cake mix with sugar. You will also experience some cracking of the top of the cake when it is baked if you eliminate sugar from the recipe. Powdered honey is a good substitute for sugar if you really want to leave sugar out of your cake. But beware, while honey is not table sugar, it is in itself a form of sugar. So you need to decide if you want dog cakes that contains no table sugar or no sugar of any sort. With no sugar of any type, you will not get your cake to brown, it will rise less, be drier and will more easily crumble. Eggs help make a cake light and fluffy. They serve as a leavener, add moisture, and help bind all of the ingredients together. Eggs are also all natural and healthy. We see no reason to eliminate eggs from dog cake recipes but it can be done. Some doggie bakers will use egg replacers found in the grocery store egg aisle. Or they may use 1/2 a banana or 1/4 cup applesauce to replace one egg. Leaveners help make a cake rise. As you have read already, sugars and eggs have a certain degree of leavening power. But a good dog cake recipe requires baking soda, baking powder or both. This is even more important if you are using a heavy flour like whole wheat flour. Leaveners act by creating a chemical reaction when they get wet. Moisture causes them to release carbon dioxide bubbles into the cake batter. These bubbles expand with heat and thus cause your cake to rise. Baking soda is activated once wet but only in the presence of acid. Most recipes for dog cakes don't include acidic ingredients such as lemon juice or buttermilk so baking soda by itself is not the best choice. If you do use baking soda in a recipe, you should get your cake in the oven as soon as you wet the mix before the carbon dioxide bubbles are all gone. Baking powder is a mixture of baking soda, acid and starch. It is used when there is no acidic ingredient present. Baking soda contains two acids (thus the name "double-acting"). One of those acids begins producing carbon dioxide as soon as it gets wet and the other begins to act once heat is applied in the oven. A good dog birthday cake recipe that contains no acidic ingredient should call for baking powder. Fat is what makes foods taste so deliciously creamy. Without fat, foods would taste gritty or grainy. Some fats come as liquid oils (vegetable oil being a very common oil used in baking) and others come as solids such as butter, margarine, shortening and lard. Fat adds to the taste and texture of your cake. It also helps prevent gluten from bonding by coating the proteins that form the gluten web. Some bakers will use apple sauce to replace fat. This is done by replacing 3/4 as much apple sauce as fat. So if your recipe calls for one cup oil, you can replace it with 3/4 cup apple sauce. Water is used to help mix all of the ingredients together. And it begins the chemical process that makes the carbon dioxide bubbles that make the cake rise. 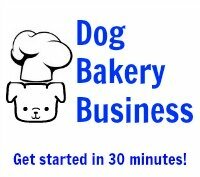 Find tips to bake a dog cake and more tips for baking a cake for dogs.